In an era of soaring gas prices and heightened environmental awareness, more and more people are taking a closer look at plug-in electric vehicles (PEVs). 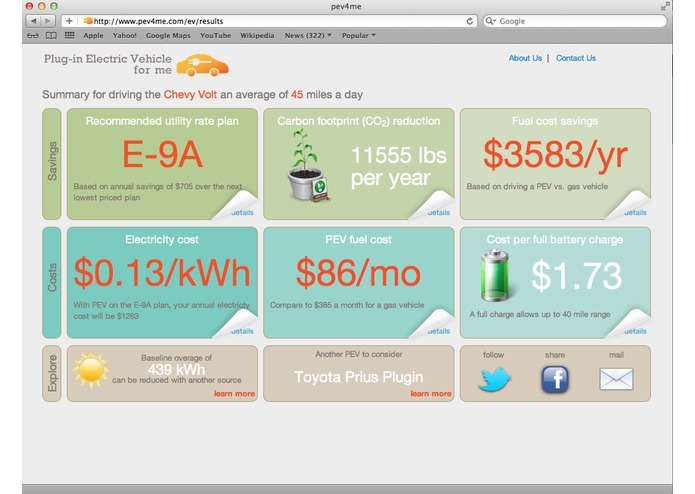 But beyond the savings at the gas pump, what is the overall impact of driving a PEV? Most PEV manufacturers only advertise the cost to charge a PEV based on a nationwide dollar per kilowatt average, usually around $0.12. However, this perspective is misleading because this rate can be vastly higher based on a driver’s current electricity usage. Since most consumers already use most of their baseline electricity allocation for their home electricity needs, adding the electricity requirements for charging a PEV will almost always bump them into a higher tier. 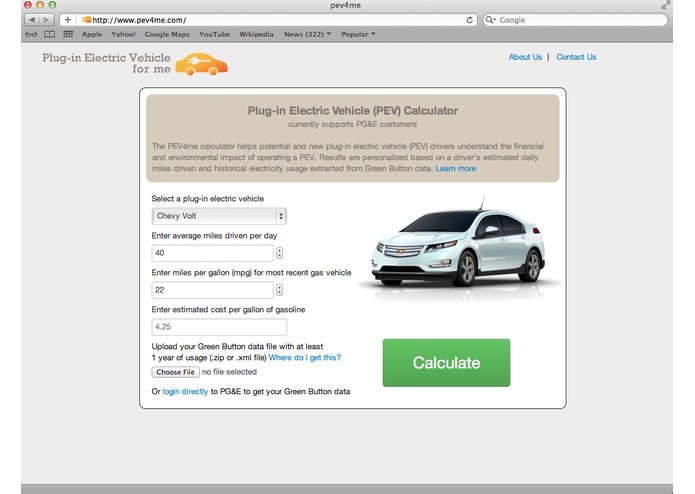 As developers of the PEV4me Calculator, we seek to quantify the overall financial and environmental impacts of driving a PEV by analyzing a consumer’s historical electricity usage (extracted from Green Button data), together with his estimated daily mileage driven, the gas efficiency of his current car, the specifications of the selected PEV, and the available electricity rate plans from his local utility company. Based on the results, the application aims to educate consumers by providing key statistics related to PEV ownership such as operating costs, environmental impact, and forecasted savings. 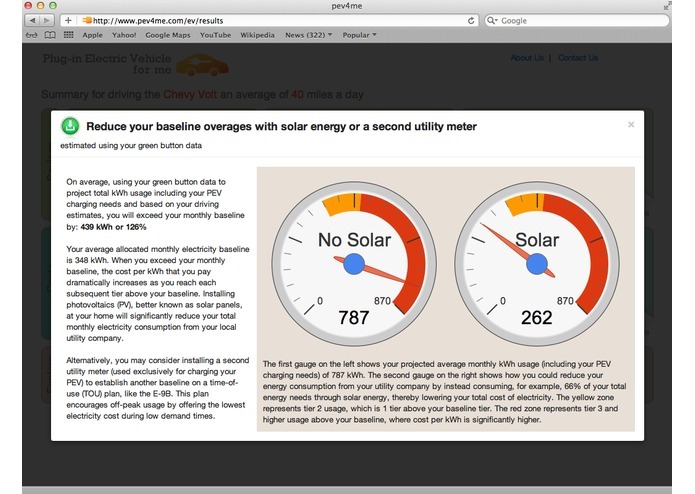 By demystifying consumers’ personal Green Button data and utility rate plans, the PEV4me Calculator helps consumers make informed decisions regarding rate plans, electricity usage, and PEV model. Additionally, it is our hope that by providing this resource, potential and current PEV drivers will learn about the potential cost savings and environmental impact of cleaner technologies like PEVs. In reviewing the results and recommendations of the application, we hope drivers will not only be able to select the optimal rate plan for their electricity needs, but also be encouraged to shift certain activities to different times of the day to realize additional cost savings while aiding to maintain the stability of the power grid.